Golfing is a great sport, but you do need to make sure that you have your clubs with you so that you can take them to the golf course. Rather than trying to fit them into your car, which can be uncomfortable and difficult, it’s a much better idea to invest in a roof cargo box for your golf clubs. While it can be tempting to buy the first option that you find, it’s a good idea to make sure that you take your time and research so that you can choose the right one for you. A great box won’t just make it easy to transport your clubs, but it will help to keep them safe when you are on the road so you don’t have to worry about them being damaged. While this roof box may have been designed for winter sports and is perfect for holding four to six snowboards or six to eight skis, it’s also a great option for the avid golfer who wants to make sure that they can take their clubs with them, no matter where their destination. The inner mat in this roof box is a wonderful feature that is designed to help protect your clubs when you are on the road. It works by preventing them from moving around in the box when you’re traveling and is also great for reducing the noise of them banging together. The box itself fits perfectly on most cars and is designed to allow a hatch to be opened and used without the box getting in the way. Additionally, it features dual side opening, which makes it easier than ever to reach in and pull out your clubs when you have gotten to the golf course. 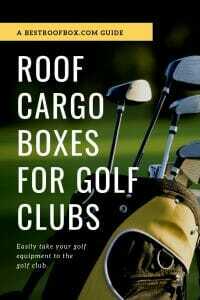 Thanks to the protection that this box offers and how easily it can be installed, it really is the top option when you are shopping for a roof cargo box for golf clubs. One of the great things about this roof box is that it is designed to easily hold up to 110 pounds, which means that you can bring not only your clubs, but also clubs from your friends or family members without worrying about exceeding the weight limit of the box. Because it ships pre-assembled, you won’t have any delay attaching it to your roof and hitting the road. The U-bolt mounting system is universal and allows this box to easily attach to most roof racks without any problems. At 13 cubic feet of space, this isn’t the largest roof box on the market, but it is perfect for transporting your clubs. In fact, the smaller size makes it easy to pack your clubs without having to worry about them banging around in the box when you’re on the road, which can damage them if you’re not careful. The durable ABS material used in its construction ensures that the box can stand up not only to intense rainstorms, but also to UV rays, ensuring that your clubs are protected at all times. This is a great space saving option for any golfer who is looking for a durable and strong box, but doesn’t want one that is too large. It allows you to store your clubs in the box, but also is designed to be small enough so that you can attach other items to the roof rack at the same time, as well. The sturdy U-bolt installation makes it fast and easy and allows you to attach the box when you’re in a hurry. The load capacity of this box is a little lower than others on the market and is only 75 pounds, but most golfers won’t find this to be a problem. Clubs will easily fit inside the box when they are removed from the golf club bag. This Thule box does require more assembly than most other similar options, but it is relatively easy to do. Since the box includes 2 locks, you never have to worry about whether or not your golf clubs will be safe when they are in the box. Your contents will be locked securely inside the box, and the box itself will be locked to your roof rack, providing peace of mind. The great thing about this cargo box is how roomy it is on the inside, which means that not only can you bring your clubs with you when you’re on the road, but also that you can store them inside the golf bag when you put them in the roof box. This is not very common, as most roof boxes simply aren’t large enough on the inside to hold the golf club bag as well. Of course, larger bags may simply be too wide to fit, but smaller ones will fit securely, preventing them from rattling around. The quick release attachment kit included with this box makes it possible to attach the box to your roof and to remove it in just a few minutes, which is great for users who are in a hurry. The box opens on the passenger side, which prevents injury and accidents when accessing the items on the side of the road. It fits on most factory racks without any problem, and the rugged ABS material used in its construction is not only attractive, but also incredibly durable, so there is very little risk of the clubs being damaged when on the road. Thanks to the aerodynamic design of this box, you never have to worry about negatively affecting your gas mileage when you take your clubs to the course. No matter if you simply have a very small car or don’t want your clubs rattling around inside when you’re on the road, this is a great option for most golfers. It’s perfect for smaller cars, thanks to the slim appearance and shorter style, but it is still 58” long, which means that you can store your clubs inside without any problems. Many golfers worry about the safety of their clubs when they are on the road, but you won’t have to when you opt for this wonderful option from Yakima. The included SKS locks are some of the strongest and most durable on the market and are designed to prevent anyone from being able to break into the box. Additionally, it seals completely and tightly when closed. This durable cargo box weighs just 75 pounds, which makes it easy to put on your vehicle, but also gives it a little weight and heft so that you don’t have to worry about its security when on the road. This great roof box is designed to offer you all of the support and room that you need without adding too much extra weight to your car, which can slow you down and negatively affect your gas mileage. Not only is it easy to put on your car and perfect for trips, but it features internal lid stiffeners so that the lid doesn’t come down on you when you are accessing your clubs. The design of the box has been perfected to reduce any drag and noise, which means that when you have the Yakima Skybox Carbonite on your vehicle you won’t hardly know that it is there. This makes car trips much more pleasant and prevents you from having to hear the wind whipping around a larger box. The box opens on both sides to make it easy to access your belongings and the superlatch secure closure system in addition to the SKS lock helps prevent anyone from opening the box. This is an incredibly long roof cargo box, making it a wonderful option for taller golfers whose clubs may not easily fit in some of other roof boxes on the market. Not only is it longer than most boxes, but it has internal dimensions of 31” wide and 14.5” high, providing ample room for all of the clubs and accessories you want to bring, including a soft golf club bag. While it is designed to be perfect for winter sport gear, it can really meet the needs of golfers as well due to the great internal dimensions that it has. The central locking system on this box has been designed to offer incredible security and to prevent anything from being taken from the box. Once the locking points are all closed and engaged, then the key can be removed. By preventing the removal of the key until the box is completely secure, Thule ensures that your clubs will be safe and provides you with great peace of mind. This 14 cubic foot box is perfectly sized for winter gear such as skis and snowboards, and it is this increased length that make it such a wonderful option for transporting golf clubs, as well. Not only is this roof box perfectly sized to hold your clubs, but it is designed to be aerodynamic and to allow you to easily open the hatch of your car. Because of the way this INNO box fits on the roof of your vehicle, you won’t have to worry about it blocking your view out of the windshield. Additionally, this box has a strong seal that has been reworked and designed to prevent any water from entering the box when you are in a storm, which will protect your clubs from bad weather and potential damage. It also has a safety lock that securely locks the lid to the base of the box. Since the key can only be removed when the lid is securely shut and locked, you never have to worry about accidentally leaving the box partly open and putting your gear at risk. This rugged roof box may be just what you are looking for if you want to make sure that your golf clubs will be perfectly safe no matter where you are going. It’s great for skis and snowboards, which means that it has all of the length that you need to be able to store your clubs inside without worrying about them knocking into each other or becoming damaged on the road. Not only does this box feature passenger side opening so that you don’t have to worry about opening it near traffic, but it installs incredibly quickly on your vehicle. The quick release attachment kit included with this box makes putting it on your roof rack faster than ever. It fits easily on most factory racks so you don’t need to make any adjustments or buy new equipment. Everyone knows that when you are going to be traveling with your golf clubs you want to make sure that they are going to be safe and protected from water damage. That’s one of the reasons why this box is such a great option for golfers. It’s designed to be 100% waterproof and has durable seals that prevent water from leaking into the box or blowing in during a very hard rain. It is rated to withstand multiple bad weather conditions without showing signs of wear and tear and without allowing your clubs to become damaged. The metal lid stiffeners make the box much stronger and more durable than other options on the market. It can hold an astonishing 165 pounds, which is a much higher weight limit than many other options and allows you to bring all of the clubs for your entire family. The four quick connect anchors make it easier than ever to install this box on your roof, and thanks to the dual-sided opening, you can easily access you clubs without any problems. One great feature that really sets this cargo box apart from others on the market is that it has a durable and touch AeroSkin covering. This is a diamond-textured material that is designed to not only protect the box and your clubs, but also to help keep the box in great condition for longer, no matter the weather that it is used in. Thanks to the aerodynamic shape of the box, it easily cuts through the air when you’re on the road, which won’t slow you down. The oversized secure lock is designed to keep the box shut securely at all times, but is easy enough for the owner to open with one hand. Additionally, the mounting system is designed so that you don’t need any tools to attach this box to the car. The quick-grip system is easy to use and ensures that your box will be securely attached to the roof rack in just minutes and without any hassle. This box is much smaller than some of the others on this list, but even though it only has 11 cubic feet of space, it is a great option for any golfer who wants to keep their clubs safe when on the road. It’s a very long box, with an internal length of 82.75”, allowing you to easily travel with longer clubs without any problems. The lower design of this box makes it incredibly aerodynamic, and reduces the wind resistance that you will feel when traveling with this box on your car. In addition to offering passenger-side loading and unloading for additional user safety, this Thule box has a fast-grip mounting system that allows you to attach the box to your car in just a few minutes. This feature, as well as the professional locking system, make it a great option for any use. The key can only be removed from the box when all locking points are secure, which prevents users from driving with their golf clubs in danger. With so many great options to choose from when you’re looking for a roof cargo box for golf clubs, it’s easy to find one that will meet your needs. These boxes are perfect for taking all of your clubs with you when you’re heading out for a game and will ensure that they are protected from bad weather and theft when left in the car.